The Facebook "memories" function has informed me that it was 10 years ago this week that my oldest son started kindergarten. He's now a sophomore in high school. Among other things, this means I've been making sack lunches for at least 10 years. If you do the math, calculating three sack lunches per day for the better part of a decade … well … that's a heck of a lot of sack lunches. One might think that makes me an expert in the matter, and to some degree that's true, but my culinary creativity doesn't really extend to sack lunches. I save those creative juices for dinners and desserts, food columns and cookbooks. I'm never going to win the award for the parent who makes the best sack lunches, food writer or not. I came to terms with that a long time ago. Besides you guys, that award isn't even a real thing, other than in the imaginations of parents just like me. Give yourself a break, parents. If you are a parent just like me, then you probably have picky children too. Particular little humans with minds of their own who cannot agree with their siblings on anything, especially what goes into their lunch. Then inevitably, we are making three different lunches with three different variations of the same sandwich. 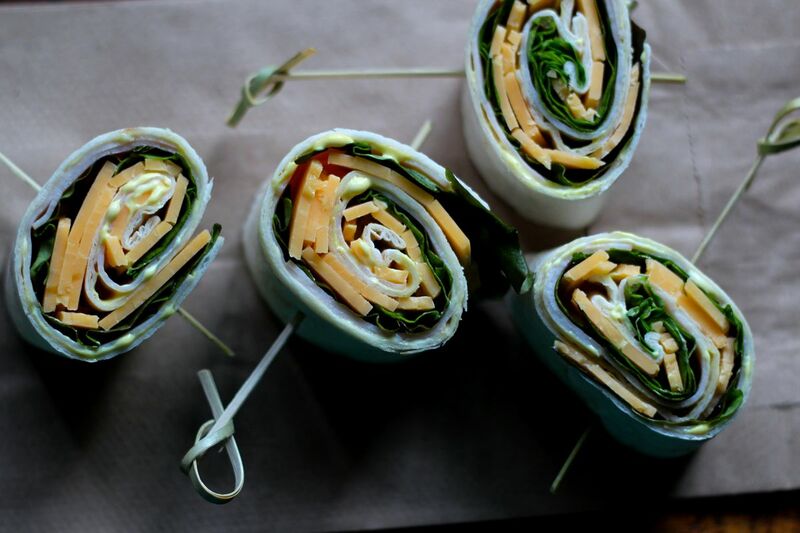 So, inspired by Pinterest, because my ideas have all been spent, I decided to take those boring old turkey sandwiches and transform them into a roll-up (also known as pinwheels or wraps). I walked up to my youngest, holding a turkey roll-up, and asked, "Would you eat this if I put this in your lunch?" Her eyes lit up, she snatched it from my hand, and shoved the entire thing in her mouth. Thumbs-up and enthusiastic head-nodding followed. Apparently if you disguise a turkey sandwich and make it look like something entirely different, you might accidentally win some sack lunch awards after all. Who knew? Note about this recipe: this is more of a method than a recipe. Feel free to change up the ingredients according to your family's preferences, like swapping roast beef or ham for the turkey, ranch dressing or honey mustard for the mayo+mustard combo, or pepper-jack cheese for the cheddar. There are also many large tortilla wrap options in bigger grocery stores, like whole wheat or spinach. Use whatever you like best. Lay the tortilla on a flat work surface. Spread the mayonnaise and mustard evenly on the tortilla. Place the turkey slices in an even layer on top of that covering almost the entire surface of the tortilla, followed by a layer of lettuce, and finally, a layer of cheese. Beginning at one end, roll the tortilla up slowly and tightly, holding everything in place as you roll. Slice the wrap into 4-6 roll-ups, trimming off any extra tortilla on the ends. Secure each one with a skewer. *Use a pliable, leafy lettuce like red lettuce or butter lettuce for easier rolling. Iceberg or Romaine would not work as well.